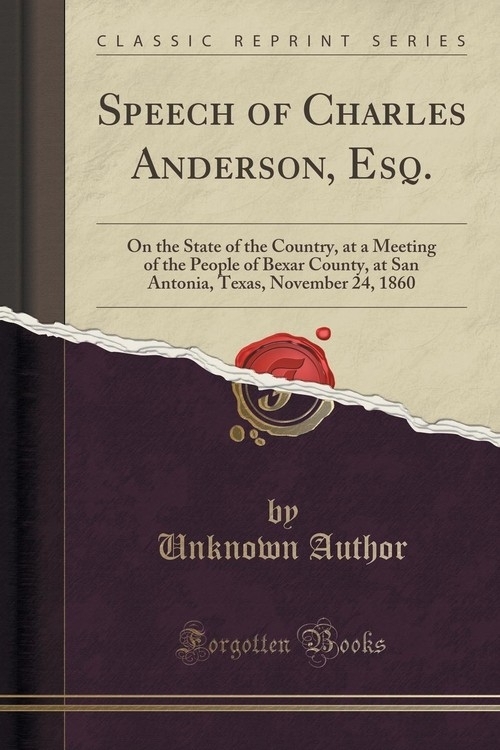 Speech of Charles Anderson, Esq. Methodist preacher, nor a Presbyterian preacher, nor a preacher, or priest, or layman, of any persuasion or denomination. And I trust in God I never shall be, if I should be thereby compelled to forget my love for my whole country. Alas! for me, sinner that I am, I have in truth no religion, except that earnest and ardent devotion to the Union of these States and my native land, in which I was nurtured from my birth, and which I shall take with me to my grave. I cannot, then, superadd to my facts and arguments, the weight of any church or association, much less that vast weight which the very extraordinary mental abilities and moral influence that Dr. Boring brings into this arena of debate. Few men anywhere equal that gentleman in the clearness and depth and breadth of his intellect, and the force and directness of his logic; the simplicity and intelligibility of his diction; his scientific and scholarly attainments, or in that imposing, moral influence over his audience, with which such qualities always arm a speaker, who obviously has an honest, earnest, ardent heart. I have often been a witness to these powers and qualities of this gentleman in his pulpit. And we have all seen and felt them in this discussion. But there is one thing I can do as well as other men. I can speak plain, straightforward truths, when I know them. And, as I have had occasion and the courage often before this, in the northern States, to audiences as large and as heated by partizan and sectional passions, as you are on this momentous occasion, to utter most unwelcome truths of fact and warning, so do I now and here make bold to tell you to your faces, what I know or think of the rights, interests, duties and faults of the South, and in all this now dreadful matter. My friends, this is by no manner of means the first time that I have discussed these high and solemn themes. Then, however, they were in the distance of apprehension. Now, alas! alas I thanks only to the madness of sectional parties, they are frightfully near and instant upon us. "We have truly fallen upon evil times." A meeting of American citizens is here solemnly convened, seriously to discuss and decide the further existence of our blessed Union! And has it indeed come to this Has the madness of faction, the virulence of fanatacism, at last reached this point Have sectional partizans finally dared to make, or devise, an assault upon this beloved and most glorious Union, which our Fathers of the South and the North shed their united blood to cement and establish; which our Mothers blessed in the earliest prayers of their infancy; which nurtured and protected our first and best years, and which, under God's providence, is, I trust, destined to be to our children's children, to the latest generations of mankind, the very greatest boon and blessing which human minds and hands ever planned and executed, or the Divine Will has permitted. Oh! may it stand, my friends, as deep in the earth and high in the Heavens as the grandest mountain; as wide and glorious as "old ocean," and as all enclosing and vitalizing to its generations as the circumambient air! Whilst ever these fair, blue and bended skies, with their kindling lights of day and night, shall surround our earth, oh! may this dear Union of our native land - the next most wise and pure and grand of all the creations - alike continue to encompass us and ours forever. But now, alas! we are "calmly and deliberately" assured, from the pulpit of the Law and Gospel - by no frothy, shallow demagogue of politics - accursed politics! - by the lips and tongue of a man really wise, pious and honest - that this vast fabric has crumbled; "that the Union is already dissolved." Tytuł: Speech of Charles Anderson, Esq.